Egypt hosts the third round of the Europe/Africa Zone Group II of the 2018 Davis Cup, hopes are high for Egypt to advance to Europe/African Zone Group 1 next year. After 22 years, Egypt does it again. This is the second time in the history of Egypt’s participation in Davis Cup to be selected to play in the third round of Europe/Africa Zone Group II. The last time was in 1996. 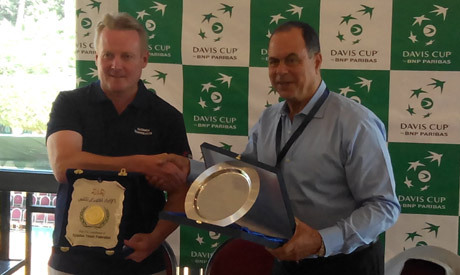 The Davis Cup draw and press conference was held on Thursday at the El-Gezira Sporting Club in Cairo, where it was revealed that Egypt has been paired with Finland. 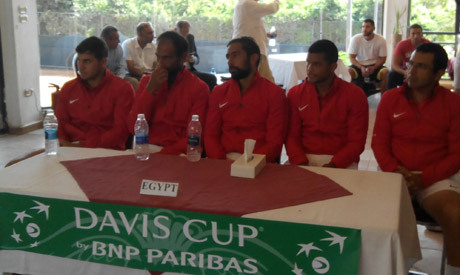 The Egyptian team includes Mohamed Safwat, Karim Mohamed Maamoun, Sherif Sabri and Akram El-Sallali. Safwat is ranked 191, Maamoun 373, Sabri 1445 and El-Sallali (in doubles ranking) 736 according to the Association of Tennis Professionals (ATP) tour world rankings. “There is a good balance of experience in the team. Two of the players are a little bit older, Harri Heliovaara 29, and Henri Kontinen 28 have been competing for many years in the Davis Cup. The rest of the players are aged between 20-21 years old,” he added. “We have had the same team were competing for the whole year, we have good team spirit,” said Nieminen. The matches will take place from 14-15 September at El-Gezira Sporting Club in Cairo. The opening ceremony is on Friday morning. In the single's contest, Safwat will play against Finland’s Emil Ruusuvuori, and Maamoun will play against Harri Heliövaara. On Saturday, the matches will start at 10 am. The day will begin with a double match between Safwat and Sabri against Finland players Henri Kontinen and Patrik Niklas-Salminen. This doubles match will then be followed by two single matches. The first match will pit Safwat against Heliövaara, and the second one place Maamoun against Ruusuvuori. The winner of the three matches will be what determines which team will be promoted to Europe/Africa Zone Group I next year. Tickets are available in ITF headquarter in Cairo Stadium and El-Gezira sporting Club. Egypt first competed in the Davis Cup was in 1929. Egypt’s best performance was reaching the Europe/Africa Zone Group I semi-finals in 1982 and 1985. In 2018, in the opening round, Egypt beat Norway 4-0 in the first round of the Europe /Africa Zone Group II. In the second round, Egypt won over Denmark 3-. In 2017, Egypt won the four matches in the first round in Europe /Africa Zone Group III. In the first round in Europe /Africa Zone Group III, Egypt won over Benin 2-0. Egypt then beat Zimbabwe, Rwanda and Nigeria 3-0.